Three Tomorrow’s Voices Autism Centre therapists have achieved board certification, with Frances Parkes, Jahnae Harvey and Naomi Taylor working tirelessly to receive a passing result to qualify toward the Board Certified Behavior Analyst Certification [BCBA]. Ms Harvey is the second Bermudian to receive her BCBA, after fellow Tomorrow’s Voices therapist Natasha Pedro-Petty passed in 2015. “Becoming a BCBA means that I am the second Bermudian to obtain this certification and therefore I can help grow and advocate for the field of ABA here in Bermuda,” said Ms Harvey, who holds a master’s degree in Educational Psychology from West Virginia University. For clients at the Early Intervention Centre, it means they now have access to four certified behaviour analysts. “To have four certified behavior analysts working in such a small Centre is fantastic for ABA services on the island. 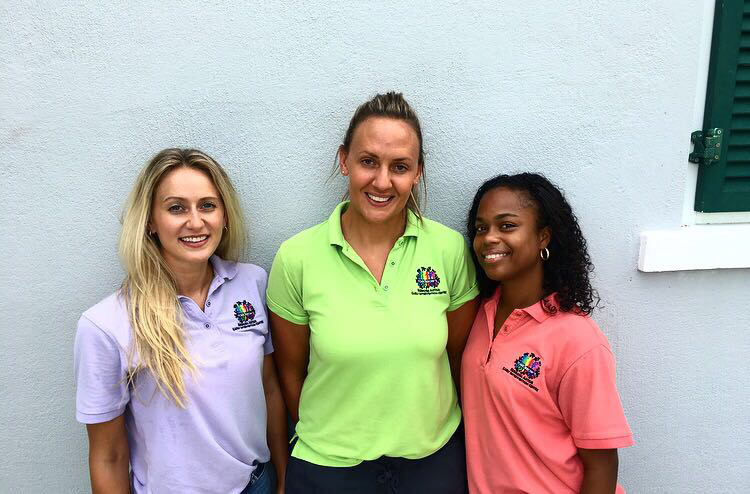 It is really exciting to see how we can expand our services and continue to provide high quality ABA to those who need it in Bermuda,” said Ms Taylor, who along with Ms Parkes joined Tomorrow’s Voices from the Jigsaw CABAS School in the UK, which specializes in offering ABA services for children on the Autism Spectrum. The work towards becoming board certified began many years ago when the therapists first started out studying to get involved in the field of Applied Behavior Analysis [ABA]. Tomorrow’s Voices is the only organization in Bermuda that provides 1:1 therapy based on ABA, using evidence-based approaches to principles of behaviour in order to meaningfully improve socially significant behaviours for children with Autism Spectrum Disorders and Developmental Disabilities. “I have been working towards this certification while I was still studying as an undergraduate,” said Ms Harvey. “I am now in my third year working at Tomorrow’s Voices and during my career here I have obtained supervised experience hours under the direction of a BCBA. Ms Parkes and Ms Taylor have used their time at Tomorrow’s Voices to further study and research using data analysed and created based on work with the Centre’s clients. This year the Association for Behavior Analysis International [ABAI] accepted their research papers and they were invited to present their work at the 43rd Annual ABAI Convention. “Passing the BCBA is an important stepping stone in progressing in the field of behavior analysis. I hope to continue to produce research and gain experience in the field. The next step is to work towards becoming a BCBA supervisor in order to offer support and training to others who are working towards becoming certified,” Ms Parkes said. Ms Thea Furbert, co-founder of Tomorrow’s Voices and Chair of the Board, stated: “We are very proud of Jahnae, Naomi and Frances for putting in the hard work and dedication to become Board Certified Behaviour Analysts. The commitment of long hours of study and supervision while working full-time is not an easy feat and their dedication to the field of ABA is to be commended”. Ms Furbert also stated: “We are also proud to have another Bermudian, Jahnae Harvey, receiving the BCBA Certification. Her achievement as the second Bermudian to receive this Certification will no doubt benefit the community for many years to come”. For more information about Tomorrow’s Voices and ABA therapy, contact 297-4342 or email info@tomorrowsvoices.bm.